Work Like the Pros Without the Cost! Free drawing software created a spark inside of me like nothing else had before by allowing me to bring what I was drawing on paper into the computer where I could instantly share it with the whole world over the internet. There are a number of different types of drawing software out there. I checked out what I thought was the best free drawing software for each of the following areas: drawing and painting, illustration, and 3D. You may have heard of some commercial software, so I have compared these free packages to those commercial ones so you should have some idea of what to expect. The fist software is called Sketchup and is brought to us for free by the kind people at Google. This free drawing software is a little different than the other packages. This one deals in the third dimension, or 3D. I first saw this program a few years ago, and it looks like Google has bought it and now released it for free - lucky us! I gave it a try and in about 10 minutes from installing the program I had created this little art-modern living space. I think this software is really cool - and if you are studying perspective, or are interested in architectural or technical drawings I would really highly recommend it. I'm having so much fun with this I think I may try designing a dream house for myself! If 3d and perspective sounds interesting to you go check it out at http://sketchup.google.com. InkScape is illustration software similar to the commercial packages Adobe Freehand and Adobe Illustrator, but without the cost. If you would like to try making some really nice clean computer drawings like you see in magazines or on television this software can help you get started. I played with the software and quickly created this smiley face. Illustration software is essential to learn for anyone wanting to be a graphic designer. Why not start today with similar tools similar to what the pros use? For more information please look at http://www.inkscape.org. 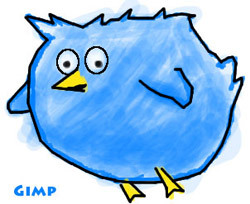 The other free drawing software that I looked at is called Gimp. This is the most popular free drawing software that you can currently find on the internet. It's quite similar to Adobe Photoshop, and I was amazed at comparable they are. Originally popular with manga and comic book artists in Japan; training materials are now available online in English. One thing to note about this software that is quite different than the others is that I would recommend purchasing a drawing tablet for your computer. It's really awkward to draw with a mouse, and if you are serious about using this particular free drawing software I would highly recommend a tablet so you can use a pen. When doing 3D or illustration a tablet can be useful, but you can get by fine with a mouse. For real drawing or painting on the PC nothing beats a tablet. If you prefer to draw with a rock, stick with the mouse, but if you like to draw with a pencil, pen or brush you will feel right at home with a tablet. For more information on Gimp go here: http://www.gimp.org. I highly recommend all of these packages. When I started doing art on the computer I was limited to MS-Paint (which comes with windows) which was a pretty basic tool. Luckily for new artists today there are packages like the ones below to help you bridge the gap between traditional and digital art. That wraps up my review of free drawing software. I really feel that these three packages are the best out there right now for the different aspects of drawing and creating art on the computer. I would really suggest trying these programs out before you put any money down to buying anything. Drawing software isn't cheap, so why not try it out for free before you decide to spend hundreds of dollars? Happy illustrating! If you didn't quite find what you're looking for on this page, then check out the other free drawing programs that are recommended here. There's an even better painting software similar to Adobe Photoshop that you can find on this page. Once you're ready to get into creating art on the computer you're really going to want to get a tablet. The good news is that even inexpensive tablets can be used to create professional works. Learn more about which tablet is right for you. In this lesson you will learn about how to download and get setup with this fantastic free software for drawing. This software works great with XP, Vista and Mac, so I highly recommend it. What the video and get setup today! Paint.net is another free drawing program that you can use with a tablet. 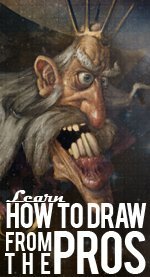 If you are just getting started with drawing on the computer you may want to check out this program and your tablet. Watch the Video for full details. How to 3D and Technical Drawing Software Tech drawing software is great because it lets you use the total power of the computer to do all kinds of amazing things that you just can't do with traditional drawing programs. This guide also has links to many free downloads of world-class 3D software that you can grab today! This guide walks you through the different types of professional drawing software out there and helps you choose the one that's best suited to the style of art you want to create.